It sounds like a lovely week. 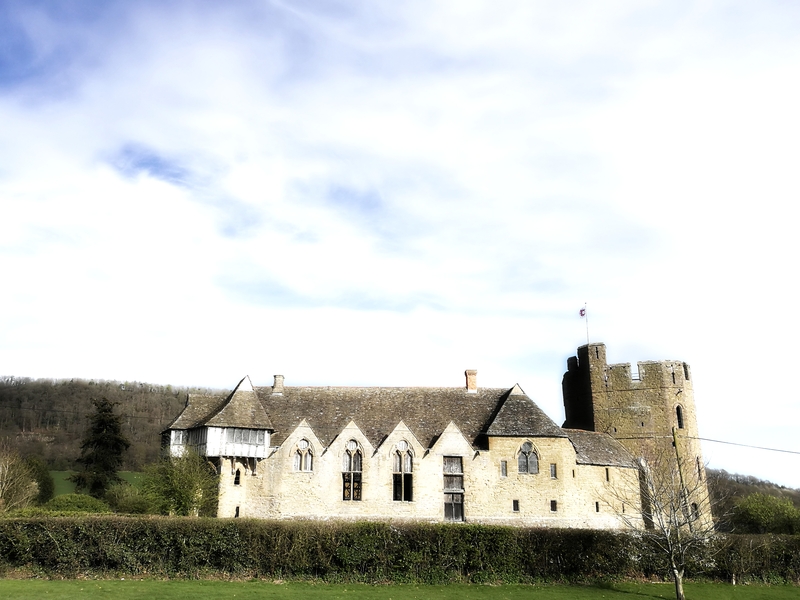 I’ve not been to Stokesay since I was 12 – must go back, now you’ve reminded me! It’s still the same – very beautiful! (Although they are building tea-rooms in the cottage in the carpark – I can sort of understand why, but it won’t be the same as drinking tea in the inner courtyard). What a great few days. I’m so glad the weather was good for you! We encountered two couples with six children between them who were walking Offa’s Dyke (a section at a time) and they were throughly enjoying themselves. It’s lovely countryside and I’m surprised more people don’t visit. We were very lucky. My OH and I are hoping to walk the Dyke later in the year or maybe next year (but it’s never a good idea to make plans in this house!). We did a short section when we were first married and have always talked about going back and now with the girls grown up it’s finally feasible again. What a lovely break – I have fond memories of Shropshire as my husband spent the second half of his childhood there and his mum and dad lived there until they passed away. So every couple of months we would visit. I loved Stokesay and Powis Castle – we have some great pictures from that time. My mum and dad in law used to walk the Long Mynd quite often but we never got the chance. Ludlow is one of my favourite Market towns and the Olive Tree ? a good place for vegetarian meals. Ooh, I’ll have to look out for that another time, but I was really impressed with Ludlow, -a few years ago we were there and I remember thinking it had gone a bit shabby, but this time it was really thriving (or seemed to be), lots of interesting businesses, and everything felt much more positive and buoyant. I think that is true of a few places – we tend to think they carry on the same between visits but towns and villages are for ever changing – sometimes thriving and sometimes run down – it is very true of places in Derbyshire – I have been visiting there all my life and I have the same observations as you quite often. at the moment it is Buxton that is on the turn but not sure if that is on the up or on the down – we will just have to wait and see – at present they are ‘doing up, the old Crescent Hotel – quite a landmark and beautiful old building I hope they renovate sensitively. Oh I do hope they make a good job of the hotel in Buxton – we’ve camped at Pomeroy, just south on the road from Ashbourne,for about thirteen years every Whitsun and I know exactly what you mean. They seem to have had scaffolding around there for an age. It would be lovely to see it flourishing again. Ashbourne is one of my favourite places – we go every year at the end of November – first for lunch and a walk around Tissington – we all pile into the tiny old fashioned sweet shop and then the gift shop – then onto Ashbourne and a walk around the town and the department store Bennetts looking at christmassy things followed by a mug of steaming hot chocolate and a homemade scone in one of the cafes – perfect! Another post bringing back memories of a long time ago holiday. In the early 1990s I spent a week walking parts of the Shropshire Way. I seemed to the only person on the route. Beautiful county. My first night was in Ludlow, then the train to Craven Arms, where I started the walk to Clun. I saw Stokesay Castle from the train, but had no time to visit. However I did manage a lovely drink in the Three Tuns. Ended up in Shrewsbury for the train back to Scotland. Great week with warm sunny weather. Ah you see, it is essential to visit the Three Tuns, I thought so! You’ll laugh, but when I was first married, we spent a couple of nights at Clun and did some cycle rides – my OH is a very keen cyclist – on the first day he cycled and I pushed my bike up the hill outside Clun and then he waited for me at them bottom while I pushed my bike down again – it was took steep for me even on the way down! I don’t think you’d think much had changed since your visit – it’s still lovely.